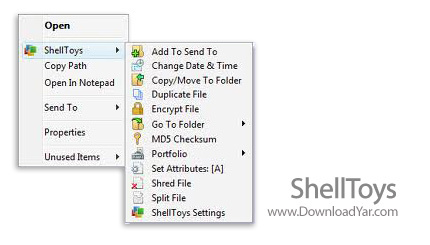 ShellToys XP puts the tools you need right where you need them � just a click away on your context menu. Right-click one or more files or folders, the desktop or the window background for instant access to 48 context-sensitive shell extensions. Visit the Shell Extensions section for full details and screenshots of all 48 shell extensions. - 50 new shell extensions in one unique package, plus 19 extra shell tools! - Free lifetime updates and unlimited free support by email for registered users!